The Only Way is Essex is a rowdy reality television show which does not, let's agree, represent my home county at its best. This begs the question: what does? That Essex, home to John Fowles, Gerard Manley-Hopkins, Coventry Patmore, Ruth Pitter, Jilly Cooper, Sydney Smith, Warwick Deeping, Sabine Baring-Gould and Joseph Conrad, is a calmer, stranger and admittedly duller place than the makers and viewers of TOWIE will ever be likely to explore. Which version of Essex is echt and which ersatz will depend on your cultural priorities.. In the Middle Ages the county was so renowned for the quantity and quality of beef calves dispatched to London meat markets that 'Essex Calf' became the slang term for a native. The sassy types caught on camera living life the Essex way, simultaneously exploiting and exploited by the medium within which they appear to flourish are, one hopes, savvy enough to avoid becoming calves for the slaughter. They all seem to know and like and even understand what they're doing. Essex traditionally gets a bad press and has not, as far as I'm aware, provided the setting for a major literary novel. Until now, that is. 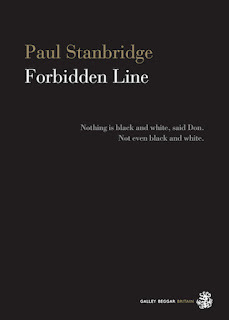 Forbidden Line by Paul Stanbridge is published today by the Norwich independent Galley Beggar Press. The author's first book is a breathtakingly ambitious attempt to re-purpose Cervantes' Don Quixote for our times. The adventurous contemporary pair are the maniac autodidact Donald J Waswill (Don) and his doltishly engaging companion Isaiah Olm (abbreviated to Is, which never fails to look like a typo and I had no idea how this should be pronounced until it's made clear after several hundred pages). The duo set off on a shambolic adventure from Don's Colchester base in the colossal Victorian water tower known locally as Jumbo (and you should Google this extraordinary structure). What Forbidden Line immediately brings to mind is the great short story by Borges - 'Pierre Menard, Author of the Quixote', originally published in 1939. You'll know this, I expect, and if not can read it here (and it takes about 15 minutes). This single story anticipates and demolishes the more absurd tendencies of literary post-modernism. Menard's grandchildren crop up briefly in the later stages of Forbidden Line in a seriously hilarious hospital episode featuring one Ian McEwan, who is clearly THE Ian McEwan. Stanbridge's Don is every bit as deranged and single-minded as his Spanish prototype - obsessed with a baffling metaphysical phenomenon he calls 'the hyperfine transition of hydrogen' and in thrall to Lady Chance, a capricious secular deity who dictates his every random move. He and the shrewdly cloddish Is set off on foot together to undergo a series of downbeat, farcical encounters with the contemporary world - our world. These are beautifully rendered and as funny anything in Flaubert's Bouvard et Pecuchet or Beckett's Mercier and Camier (two abiding favourites, both of which feature incompatible male compadres navigating the wide world and beside which Forbidden Line confidently takes its place).Don and Is make their way slowly to London, running into drunks, crusties, Chelmsford dignitaries, the Essex constabulary and feuding locals. They repeatedly destroy a hefty home-made case containing Don's Encyclopedic life work, which repeatedly reappears with its contents miraculously intact. Is cannot read or write (unless the plot requires him to do so) but has the same gift of total mental recall as Funes the Memorious (another Borges link, from the Ficciones) and becomes Don's lumpen recording angel. Wittgenstein, Heidegger and Lucien Lévy-Bruhl are among the intellectual shades who accompany the travelling pair. What grips at once is Stanbridge's beautiful, stately, eccentric and richly rewarding prose. He never lets up, never falters. The lyrical descriptions of backwater Essex are consistently lovely, providing a backdrop for mesmerisingly erudite riffs by Don on every subject under the sun, while the hapless Is offers a stalwart comic foil subject to no end of painful indignities. There's a deeply satisfying and sophisticated philosophical undertow, lots of very good jokes, lavish digressions, pointless repetitions, countless literary references,stretches of dialogue in Greek and Anglo-Saxon and Middle English, sudden violent reversals, dazzling rhetorical flights and, throughout, a sense of unalloyed authorial joy in the whole project. His sole concern is all for our delight and, while he is unafraid to court tedium when the fancy takes him (generously inviting the reader to skip such passages), he has the rare gift - vanishingly rare - of making one laugh out loud, and regularly. Chapter 27 reduced me to a giggling puddle of contentedness: at one point therein Don and Is discuss what they respectively pronounce as 'déjà vu' and 'deja-vu', leading to a wonderfully mad mis en abyme in which simultaneous hypothetical déjà vus (or deja-vus) are embedded within one another. leading inevitably to 'an eternal stasis of the hyperfine transition of hydrogen'. - What you are saying is so far over my head, said Is, that it has ice on it. 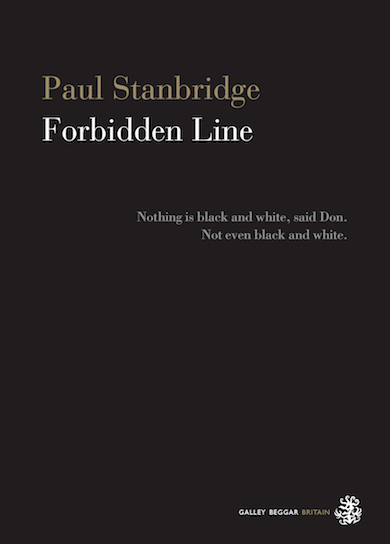 Forbidden Line is very, very silly and as wholly and profoundly serious as Cervantes' original. It's a rich plum pudding of a novel, but a plum pudding with antlers. For the first time in my ramshackle career as a literary hack I sent the publishers an unsolicited encomium (in case they needed an early blurb). In it I said that Forbidden Line was "breathtaking, magisterial, uniquely demented and hilarious - a lavish comic masterpiece". It really is. You can, and certainly should, buy a copy from the publishers here. Read it in the dog days between Christmas and the New Year. A modern day Don Quixote channeling early Wittgenstein and late Heidegger, and the events of the Peasant’s Revolt, Forbidden Line take us on a picaresque journey through Essex and London in what must be the most exuberant and maximalist novel of ideas ever written in English. It really shouldn’t work, but it does so with a kind joy and comic panache that few writers possess. It’s an achievement to be admired, relished, and loved. Not only will there be PhDs written about this novel, there will be fan-fiction and meta-fiction, and I won’t be surprised if very soon there are clubs and secret societies dedicated to unravelling how the ‘hyperfine transition of hydrogen’ permits a chest of papers continually to appear after many determined destructions. This isn’t magical realism – it’s so much more mysterious and profound than that. Copyright David Collard 2013. Simple theme. Powered by Blogger.